Webb: Another 40F degree night in January. Unbelievable. It would have been another good night to run outside, however, we had some biking to do. Elle: So I finally made it back to the gym for one of my favorite workouts, a 2-hour combo that starts with a spin class and ends with a strength class - I blogged about it this past December here. Well, on this particular day, the focus was hills, lots of big, heavy hills. Ugh. And when followed directly by a full hour of strength & conditioning, this makes the 1-mile walk home from the gym way more exhausting then it should be. When I did this last year, at the end of the season, a fun time was had by all. But after a couple of months of "off season," this workout is a killer. Webb: I may need to join Elle for one of these classes sometime. She really seems to love them. Elsewhere, I stayed home to handle some domestic responsibilities and do a late-night turbo session. 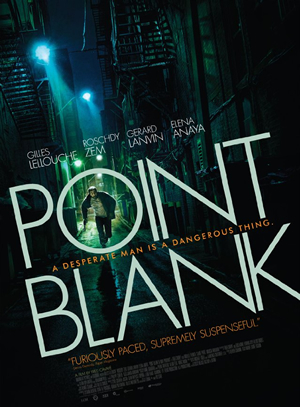 I found a fun French film called "Point Blank" (ou "A bout portant," si vous plait). It is a suspense/thriller that manages to keep you on the edge of your saddle without a lot of car chases or stunts. They do have them, but it is the story that provides the action. It follows formulas in some ways and provides a twist or two here. This looks ripe to be re-made in Hollywood in the next few years. I liked the workout well-enough. It was just interesting enough to feel like I was doing something other than just watching the movie. I've found that cycling while watching a movie can make me more stir-crazy than if I just give into the sofa. So I need the workout to occupy some of my thoughts but not so much to distract from the movie. This turned out to be a good combo.